As a follow-on to National Compost Week (which was May 4-10, thanks to Aunt Debbi's Garden for letting me know! 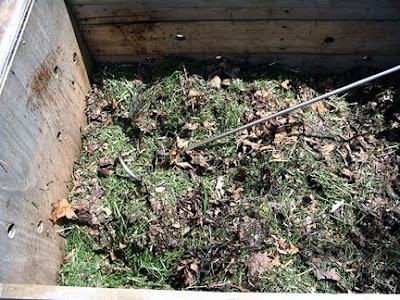 ), I'd like to show you my compost. 'Cause that's just the neighborly kinda gardener I am. And I'd like to see yours! Seriously. À la Carol at May Dreams Gardens, who asked everyone to chime in about their hoes, I'd really like to know if you compost, what kind of pile/container you have, and what the main ingredients are. A link to a photo or blog post would be great! Early spring compost bin contents: shredded leaves from last fall, first grass clippings of the season, and my trusty compost crank (visible), plus kitchen scraps and a bit of wood ash from my annual solstice bonfire (buried). I started composting maybe 9 years ago, with one of those rotund black plastic containers that you fill from the top and, theoretically at least, empty from the bottom. Unfortunately, the top opening was not optimally wide for turning the compost, and it was really hard getting it out the smallish bottom hole. Next, I drilled holes in a plastic 35-gallon wheeled trash container and that worked pretty well for kitchen scraps, leaves, rabbit doo, and the odd shredded paper (but never even shredded paper-hyuck!). The wheels were really handy when it came time to empty the container because it's heavy and dragging it would have been annoying. I still use a similar container on my deck right outside my sliding door for winter-time composting (almost entirely kitchen scraps). Not that the actual decomposition process is active in winter in Michigan, but it's a convenient place to collect the greens. It's unassuming-looking, but efficient, currently also serving nobly as a holding area for things to be planted and temporary storage for more leaves! (If I were actively composting in this bin, I would have drilled holes all the way up and on the lid.) 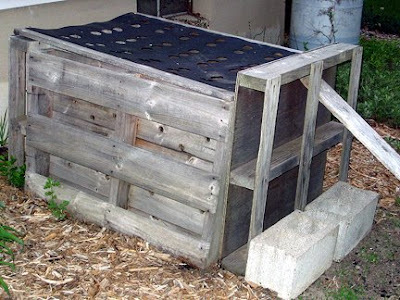 In spring, I roll and empty the bin into my larger, main bin, made of pallets. The main bin is emptied in late fall, with the finished compost spread into the garden. It is then filled with shredded leaves over the winter. So the greens are a nice spring complement. I made the pallet bin a few years back from pallets in my basement. For some reason, they did not have the usual empty space between slats, so I had to drill holes (I like a 1-inch drill bit). For the lid, I added a wood frame to a former plastic hoop composter. It latches at the back and can be opened the full way back. The front panel was meant to latch on both sides, so it could be removed entirely for easy access. However, the pallets were not uniform in size and the front one was a bit high for easy latching, made even higher by the sloping ground. As it turns out, just nudging the front panel with cinder blocks and an old piece of wood works just fine. (The bin is on a side of my house no one sees.) Note homemade rain barrel to the right! Considering I worked with neither instructions nor any kind of carpentry skills, it turned out pretty good if I do say so myself! It may look a little ramshackle, but it's actually quite sturdy and has ably served its purpose. The first year, the bottom was just the earth. But it's positioned just 15 feet from big thirsty trees with big hungry roots who were drawn to the crack cocaine of soil the lovely nutrient-rich soil under the compost bin. And then, just to let me know they were there and enjoying themselves, neener neener, they continued growing up into the pile. Thick roots. Eeny beeny feeder roots. You name it, it was there. It was really difficult to disentangle the compost from these roots—imagine a rootbound annual plug sized three feet by three feet! Oh sure, if I had been better about turning the pile, I may have noticed this before October, but... what's your point? The next year, I put down several layers of newspaper under landscape fabric. The tree roots were amused. The leaves rustled softly whispering to each other ("Can you believe this dilly human? She actually thinks those flimsy layers can keep us out!" and "Yeah, she's crazy! That wouldn't have held me back when I was knee high to a sapling!") while the roots crept unseen to their feast. And again, I should have been better at turning the compost during the year. But things happen in the summer, you know? It was almost, but not quite as, hard to free the compost from the roots that year. Cursing abounded. From me and the roots. This year, I have thicker layers of newspaper under layers of used yard waste bags under, what I'm hoping will be la pièce de la résistance, 1/4-inch sturdy-grade chicken wire combined with the resolve to keep on turnin', baby. In case you're thinking a non-porous material, like, say, a tarp might be a good solution, it isn't. Unless you happen to like compost soup. Which I did not. Drainage = good. Finally, I'm not much of a garden gadget kinda gal, and I'm not prone to spending tens of dollars on a garden gadget, but I love, love, love my compost crank (did I mention I'm fond of it?). I use it instead of a pitchfork to turn my pile. Its squiggly end turns down into the pile and can easily be lifted up. It's made by LoTech Products, but the website hasn't been updated in a long time and I'm not sure if they still sell it. And in honor of Mother's Day, I must thank my mother for turning me on to this product. Coincidentally, I posted about my new compost tumbler late last night. It was part 3 of a 3 part series. You can read Part 1, Part 2, and then Part 3 to get the whole story. 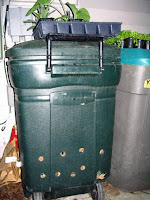 I also have traditional compost bins, and always will, but the tumbler is nice to have, too. I have the usual garden refuse in my compost, from flowers, veggies and kitchen scraps. I don't bag the grass when I cut it, so no grass clippings. I love harvesting compost, no matter how it is made! Carol, thanks for links and coinkydinks(!). I don't normally bag my clippings, but the pile needed some greens to go with all the leaves from fall. I think a tumble would be swell, especially given my lackadaisical approach to turning the pile! It is the first time that I realize that making compost is not throwing weeds on a heap! Hi Garden Faerie - I too posted about Compost Week on the 4th May! Hope this helps and greetings from sunny England! I think it very much depends on the working holiday. Beware of anything that has a lot of ragwort or scrub removal. They will definitely be unpaid labour and not very educational! However, there are opportunities to learn new skills on a lot of the holidays and those in held in the grounds of the old houses or estates will have a lot of history to them, even if the task itself is a bit more mundane - and not all of them are. Remember, whilst it is 'unpaid' labour, the National Trust wouldn't be able to survive without all the work that volunteers put in. The company and comradeship of the other people joining the tasks will be a big plus too. If you're still concerned, but like the look of a particular holiday, then it's best to ask the National Trust about it - they will be able to give you lots of information, possibly even putting you in touch with people who've been before. My previous link should give you a contact point. Thanks VP for your additional info. In case you're curious, the Chicago Jelly Bean (which is really called the Cloud Gate) is here. Hey there, I was just playing with my sitemeter and noticed people coming to visit me through your site. Thanks for the link. You do not want to see my compost bin. It is sorely in need of turning and having the finished stuff removed. It is overflowing. It has been overflowing since last summer. This is a bad situation, but I can't bring myself to confront it yet. I will say that to keep tree roots out & promote drainage, I set it up on a piece of old stockade fencing last summer, just before I filled it to overflowing. All about my compost pile and worms. Monica, I just updated my article on compost/ soil amending to include a link to your post - good stuff here. I love how you share clearly what's worked for you and what hasn't. FYI, the last method of preventing the roots did indeed work!